Okay, it’s dessert time… and Norman, you sneaky devil, you have redeemed yourself. When I saw cream cheese flan in his book, I knew I had to make it because once upon a time the most delicious flan I ever ate contained exactly this. I know that’s a hard thing for poor Norman to live up to, especially since memory often makes things better than they actually were, but by golly, he got it spot-on. It is perfect. What I love about this dessert is that it’s the best of two worlds: cheesecake and flan. If you like either one, you’ll love this. If you like both, even better. It’s got creamy caramelized undertones from the condensed milk, a fragrant whisper of almond, and a texture like wet silk. The sauce was my creation, but I think its freshness and acidity complement the rich flan perfectly. It isn’t the lightest dessert in the world, but it has that magical ability to slide into the cracks in your stomach no matter how full you think you are. For the flan, start by preheating the oven to 300F/125C. Melt the sugar in a saucepan over medium-high heat and cook it until it turns into a smooth dark amber caramel. Quickly pour into the bottom of an 8-inch soufflé dish or other round mold (or several smaller molds). Add all the ingredients for the flan to a blender and blend until smooth. Pour through a strainer into the caramel-lined mold. Set the mold into a larger baking pan and pour enough hot water into the pan to come halfway up the sides of the mold. Cover the mold with foil. Bake until the flan has set, about 2 hours (less for individual molds) – a toothpick inserted into the center should come out clean. Let cool and refrigerate overnight. For the coulis, combine all ingredients in a blender and blend until smooth (this can also be done with a hand-blender, my best friend). Strain the mixture into a bowl, pressing on the solids to extract as much liquid as possible. Taste for sugar and add more if needed. Keep chilled. When you are ready to serve, run a knife along the inside of the mold to loosen the flan. Pour about 1/2 inch of hot water into a large pan and set the mold inside for about 8-10 minutes, so that it will unmold more easily. Remove it from the water, place a platter over the top, and invert. 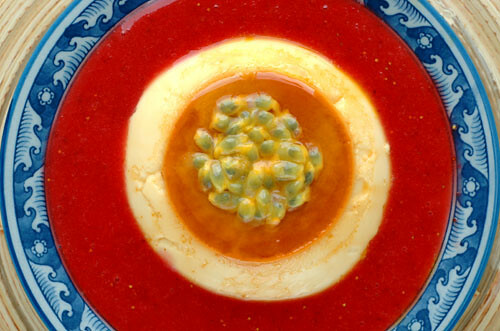 Serve the flan drizzled with the fruit coulis, with some extra passionfruit pulp on top, if desired.